If you are a keen dahlia enthusiast and want to see what it would be like to grow a very large specimen bloom, then it is worth knowing that there is a method of making the flower heads grow considerably larger than normal. This can be done by a process called ‘disbudding’. Disbudding, as the term suggests, is the process of removing surplus buds on the stem of the plant as they appear. If you were to leave the plant and not disbud, then no harm would come to it. In fact, you will end up with many flowers on a single stem, but they would be somewhat small compared to a disbudded, single stemmed dahlia. It is not uncommon for 3 or 4 buds to appear on a dahlia stem. Disbudding works by channelling the plant’s energy into making the one, single bloom, hence it will grow to become very big. This process does not affect the colour of the resultant flower either, meaning that disbudding can be an excellent way of producing a very impressive focal point in the garden when the dahlia comes into bloom. 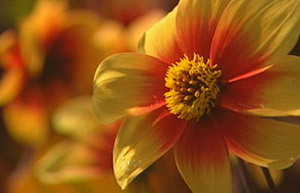 To disbud a dahlia, great care must be taken to not damage the main bud that you wish to keep. It is very easy to inadvertently snap off the bud you had intended to nurture, so pinch very lightly. Pinch off the side buds cleanly where their stalk reaches the main stem of the plant, this will normally be butting up to a leaf.